Up to 50% Off with Amazon Warehouse at Amazon This little known feature of Amazon showcases the best in new and refurbished products at greatly discounted prices, including video games, computers, clothing and more! Up to 45% Off with Deals of the Day at Amazon Catch these incredible discounts before they're gone. Deals From £9.99 In The Electronics Store at Amazon If you're a tech head, you don't want to miss these absolute steals. Up to 50% Off in the Amazon Outlet at Amazon With new items being added every day, this expansive sale section has something for every shopper! £15 Off Amazon Fresh Orders Over £60 at Amazon Save yourself £15 when you order a £60 shop from Amazon fresh using this code! 6 Month Amazon Prime Trial for Students Big savings at Amazing Prime Student! £20 Off Amazon Fresh Orders Over £80 at Amazon Sign up to Amazon Fresh and get £20 off orders over £80 with this code! 10% Off Selected Fashion Orders at Amazon Save 10% on the incredible range of clothing at Amazon. £30 Off Amazon Fresh Orders Over £100 at Amazon Spend £100 or more on your first Amazon Fresh order, and you can save £30 when you use this code! 10% Off Selected Baby Wishlist Orders Over £200 at Amazon Get prepped for the arrival of your little one and save up to up to 10% on your order with this discount code. 15% Off Baby Wishlist Orders Over £500 at Amazon Use this code to get 15% off baby wish list orders over £500. 20% Off Selected First Grocery Subscriptions at Amazon Sign up for grocery subscriptions with Amazon, and get 20% off your first order! 25% Off Selected Wine Orders at Amazon If you're looking to stock up on wine, then head to Amazon, where you can save 25% on the price of your order with this code. 30% Off 2 Selected Board Games Orders at Amazon Keep the kids entertained with wholesome family fun that doesn't cost the earth. £5 Off Baby Wishlist Orders Over £20 at Amazon Save £5 on your baby wishlist order at Amazon. £20 Off Baby Wishlist Orders Over £800 at Amazon Save £20 on all your baby essentials when you spend £800 on your baby wishlist at Amazon. 30% Off Selected First Subscription Orders at Amazon Sign up to Amazon's extremely useful subscription service for your regularly needed products, and you can get 30% off your first delivery with this code. Amazon UK isn’t your usual online shop, it’s the giant digital department store where you can shop with an Amazon voucher from vouchercloud to snap up massive price reductions in every department, including Home, Electronics, Clothing, Books, DVDs, Leisure, Beauty and everything else! Amazon is unbeatable in every way; providing an infinite number of products at competitive prices, all available for fast and convenient delivery. For bookworms, the Amazon Kindle is a must-have. Wafer-thin, light and portable, and with 1.5 million books, magazines and newspapers to download! Perfect for reading in the park this summer, or for taking with you on a sunny city break. For those into their electronics and technology, the Amazon Echo offers something new and intriguing, with Alexa setup to recognise and respond to your requests, from ordering a takeaway to finding out the latest weather update. Why shop anywhere else when you can get it cheaper and faster with Amazon? "Make sure you check out the ‘Today’s Deals’ page- you’ll find a collection of the best offers and sales available from Amazon right now, as well as a Deal of the Day and a sneak peek at what’s coming up." What is Amazon Super Saver Delivery? You don’t always have to pay for delivery when you buy from Amazon, so we can’t not mention the infamous and free Super Saver Delivery option. If you’re having your purchase delivered to the UK or Republic of Ireland and the item is eligible, you can opt in for free delivery! You’ll still get your purchase 3-5 days after it is sent. Find full details here and see below for your other Amazon delivery options. We can't promise anything, apart from the fact that Amazon Black Friday is always a big deal with Amazon! From books to fire sticks and more, Amazon Black Friday deals are bound to have you saving on loads of cool items featuring on your wishlist. Stay in touch with us, and you'll stay ahead of the Black Friday curve. Students with a valid NUS Extra Card can apply an Amazon student discount code at the checkout and receive a 5% discount on selected items. On Amazon’s help pages, you’ll find answers to most queries, questions and help topics. There are some great tools for ‘Self-Service’ help too. Go to Amazon website to find specific costs for your item in question. It depends on what you’ve purchased and why you want to make a return but most items have a standard 30 days return period from after you’ve received them. For the highest valued items the condition must be completely unused and unopened, whereas other products can sometimes be returned, refunded or exchanged if they have been used. Amazon have devised a system to make returning an item quick and easy. You can use your Amazon account to select the order, the item you want to return and print a label to attach to the parcel. The Returns Support Centre can help if you have any problems. Amazon is the UK’s leading e-commerce site, selling pretty much everything you can imagine. 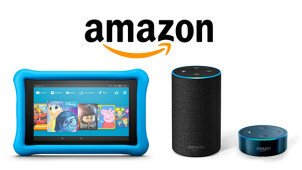 From tablets and home entertainment systems to clothing, toys and beauty products, the range of products available on Amazon is huge. Luckily, with an Amazon discount code from vouchercloud you can get Amazon products for less, whatever your interest. Whether it's an Amazon fire stick for a gift to self, or a Kindle book for mum - shopping has never been so easy and efficient. What are you waiting for?! Amazon Prime membership comes with a whole host of benefits, including access to thousands of films and TV shows with Prime Video and millions of songs with Prime Music. Perhaps the biggest bonus though is Prime delivery, the unlimited one day delivery service available on millions of Amazon products. To top it off, with Amazon Prime discount codes available at vouchercloud, you can save on all of the above when becoming an Amazon Prime member. Even if you've left it until the last minute, you can still get a top quality present from the best for less! With so much choice on Amazon it’s almost impossible to pick our favourite products. You can’t really go wrong with an Amazon Fire TV Stick, which connects your TV to a huge selection of movies and TV shows from the likes of Netflix, BBC iPlayer and, of course, Amazon Prime Video. Don’t forget to apply an Amazon promo code at the checkout to get a discount on the full price. Spend your summer evenings curled up in front of Prime TV's Vikings, The Man In The High Castle and more!